Click-N-Ship® is an online postage service offered by the United States Postal Service® that allows you to create pre-paid shipping labels for certain mail classes-including Priority Mail®, Priority Mail Express®, Priority Mail International®, Priority Mail Express International®, and Global Express Guaranteed®—using your own PC and printer. Other mail classes and special services such as First Class Mail®, Media Mail, stamps for regular letters, First Class International, Certified Mail™, and Parcel Select Ground® are not currently available using the Click-N-Ship program. With Click-N-Ship, you can print postage and shipping labels for certain mail classes without a trip to the Post Office. After you’ve printed postage, you can even schedule a USPS® pickup to have your shipment picked up by your letter carrier at the same time your mail is delivered. To avoid going to the post office altogether, be sure to use Click-N-Ship to schedule a free Carrier Pickup. If you need to print postage for other mail classes, such as First Class Mail, Media Mail or Parcel Select Ground, Stamps.com offers a complete mailing and shipping solution to manage all your postage needs. Like Click-N-Ship, Stamps.com allows you to print official, USPS-approved postage (including stamps!) and address labels from the comfort of your own home or office. Stamps.com also gives you 24/7 access to all the USPS services you need, including Carrier Pickup, Certified Mail, USPS Tracking, package insurance and more. Stamps.com facilitates high-volume shipping by allowing you to batch print pre-paid shipping labels, and its automated forms eliminate the need to fill out Certified Mail, Return Receipt, and International Customs forms by hand. Many shippers also take advantage of Stamps.com's popular Hidden Postage feature, which allows you to charge shipping and handling fees that accurately reflect your costs without triggering customer complaints. 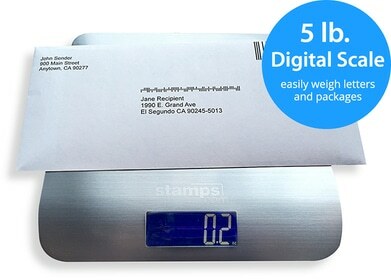 Finally, an integrated USB scale enables you to easily and accurately weigh your shipments and takes care of determining the exact amount of postage needed.